As a composer, Mari’s commissions include the International Computer Music Association, Harvestworks, Music from Japan and others, supported by grants including New York Foundation for the Arts, Arts International, New Music USA/Meet The Composer, Japan Foundation, Argosy Foundation, and New York State Council on the Arts. In 2010, Mari won the Guggenheim Fellowship in Composition, and invited as Composer-in-Residence at IRCAM in Paris. In May 2011, Mari was presented in a solo recital at the Bohemian National Hall in NYC by the Vilcek Foundation, in recognition of her groundbreaking work as a foreign-born artist; subsequently she was named one of 45 "Great Immigrants” by the Carnegie Corporation. Mari’s 2010 CD, The World Below G and Beyond, is devoted entirely to her own compositions and focuses on works using Subharmonics and interactive computer music. In 2011, Mari presented her “I-Quadrifoglo”, her first string quartet with interactive computer at New York’s Symphony Space, commissioned by the Cassatt String Quartet through 2010 Fromm Foundation Commission Award from Harvard. In 2016, she released a solo CD Harmonic Constellations (New World Records) featuring works for violin and electronics by American composers. Mari’s latest CD (2017), Voyage Apollonian (Innova Records) features her works for Subharmonics and interactive compositions using a motion sensor. Mari’s work has been featured in major publications including the New York Times written by Matthew Gurewitsch, and in Scientific American written by Larry Greenemeier. In October 2014, Mari received the Inaugural Award Of Composers Now Creative Residencies at The Pocantico Center of The Rockefeller Brothers Fund. In 2013, Mari inaugurated a new summer program as the Director of the Future Music Lab at the Atlantic Music Festival in collaboration with IRCAM. The program focuses on high-level performers using the latest technology. Since 2016, Mari is using MUGIC™, a prototype motion sensor extracting her bowing movement and musical expressions. For this project, she won a grant from Harvestworks “Creativity + Industry = Enterprise” program, supported by the New York State Council on the Arts with the support of Governor Andrew Cuomo and the New York State Legislature and The Rockefeller Foundation’s New York City Cultural Innovation Fund. Since 1998, Mari has been teaching a graduate course in Interactive Computer Music Performance at Juilliard. 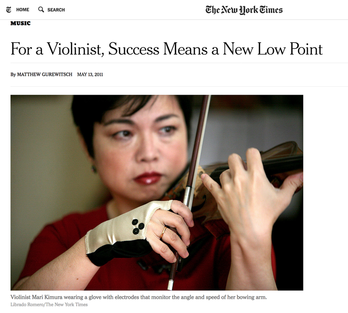 Effective July 1st, 2017, Mari Kimura was named Professor of Music at University of California, Irvine's "Integrated Composition, Improvisation and Technology" (ICIT) program, Music Department at the Claire Trevor School of the Arts.